Forms are an important element of any website. They act as a perfect bridge between the readers and webmasters. A well-designed form can play a significant role by giving your website a professional look as well as allowing the visitors to communicate with the site owner in a convenient manner. Incorporating forms on a website is very easy, using the WordPress Form Builders Plugins. 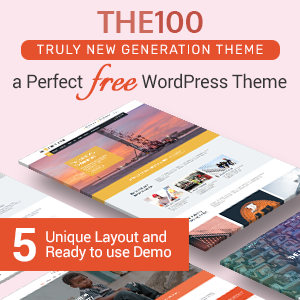 WordPress, being one of the most flexible platforms for its users consists of many WordPress themes integrated with different form builders plugins. However, if your website is not integrated with any form builders then, you can build the forms by using the WordPress Form Builder Plugins right away. WordPress Form Builder Plugins are those plugins that allow you to create different types of forms (Contact Form, Opt-in, Subscription Form, etc) and embed them on your website. 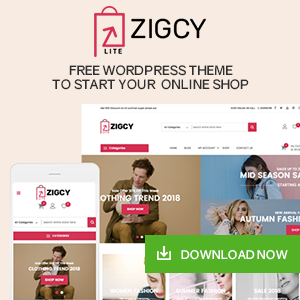 They come with different features, layouts, and customization options and hence, you can build a stunning form and present them on your website in no time. Here, I present you my collection of some the best Premium WordPress Form Builder Plugins. 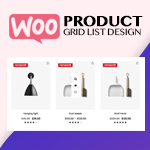 These plugins come with powerful features, stunning form layouts and tons of configuration options that will allow you to embed your website with well-designed forms. 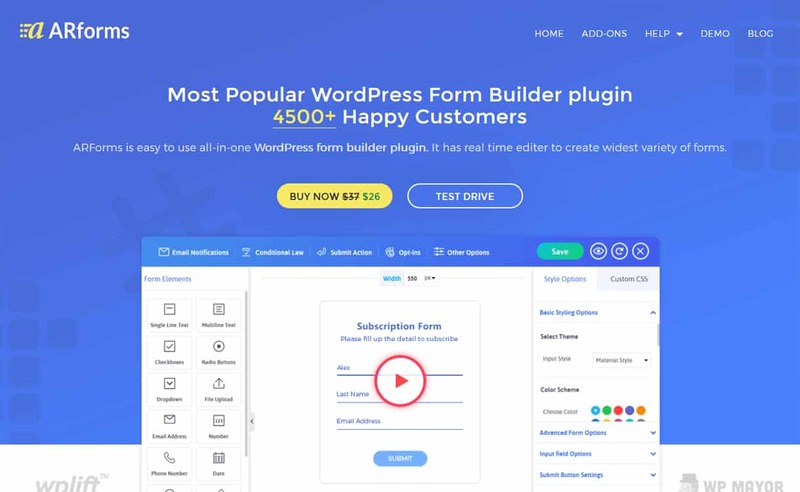 If you are looking for Free WordPress Form Builder Plugins then you can check out our collection of Top 5 Best Free Form Builder Plugins. 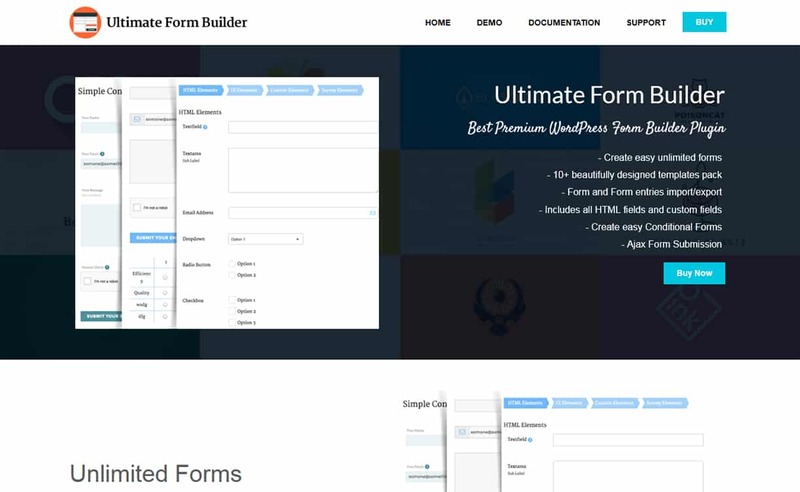 Ultimate Form Builder Pro is a Premium WordPress Form Builder Plugin that allows you to create unlimited number of responsive forms (single-step or multi-step). 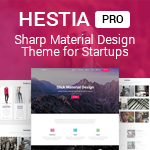 It comes with 10 beautiful pre-designed form templates to choose from to create any types of form. Also, you can preview the form before using it to your site. It is a simple and easy to use plugin that allows you to create any type of forms (Contact Us, Opt-In, Call to Action, etc) using drag and drop form builder. Besides that, all the form built using the plugin will be very secure using various captcha options. 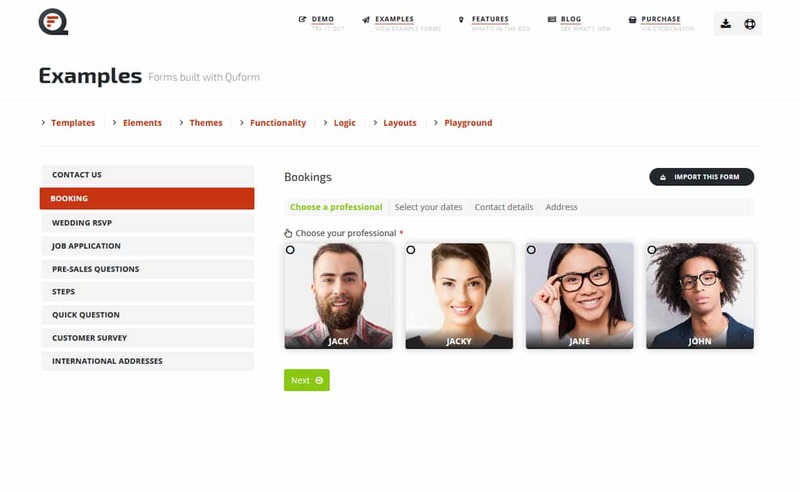 Quform is an advanced WordPress Form Builder Plugin that allows you to quickly and easily build multiple forms with full control. It is an easy to use plugin that allows you to create fully functional forms in a few clicks. Also, the forms build from this plugin is compatible with all major browsers. It is a simple plugin that uses drag and drop and one-click functionality for building the form. The plugin comes with many options for both basic and professional users. Also, there are 3 Captcha options: honeypot, image and recaptcha for keeping your form secured. 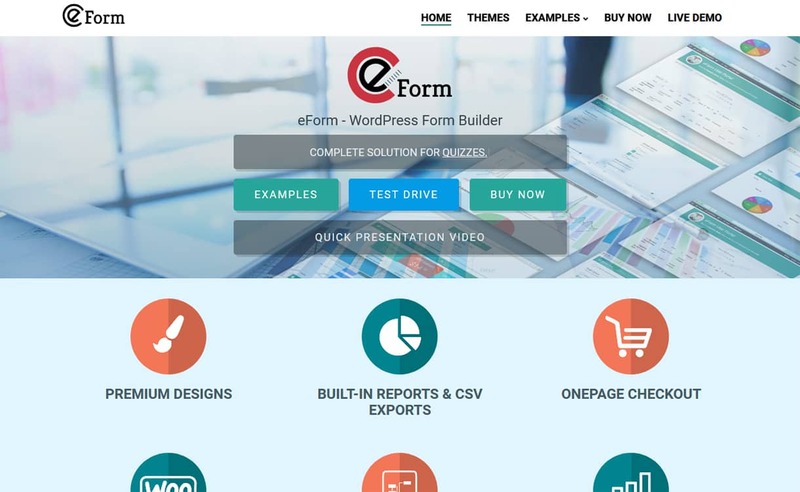 eForm is an Advanced and Flexible Form Building Plugin for your WordPress site that comes with powerful features. It is a complete form management plugin for quizzes, surveys, data collections, payment/cost estimation and all kinds of user feedbacks. The plugin comes with easy drag and drop form builder that allows you to create unlimited forms and manage them on the admin dashboard. It is a robust and comprehensive form builder plugin that comes with a perfect combination of styles and functionality. It contains all the elements that you need for creating clean and elegant forms for your website. 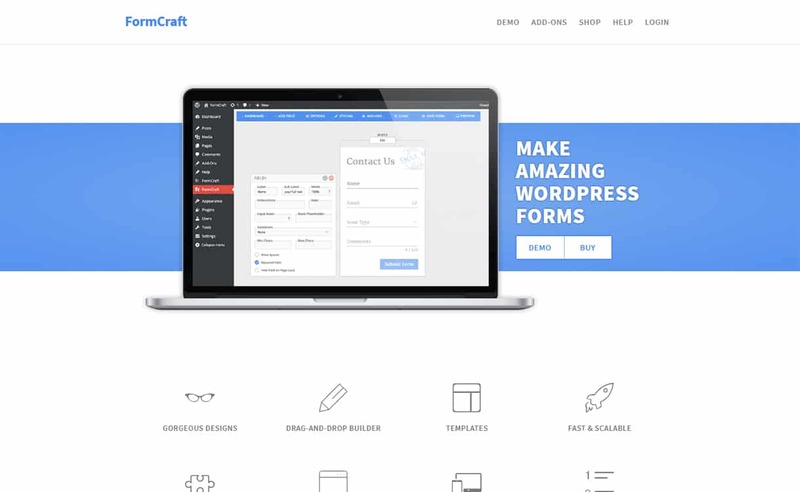 FormCraft is a Complete and Flexible Form Builder WordPress Plugin for creating unlimited forms on your website. The plugin is powered by drag and drop functionality and will allow you to create a form in no time. It is a simple and easy to use plugin with powerful features. Using the plugin you can create responsive forms that work well for all types of viewing devices. Besides that, the plugin is packed with tons of customizable options for add the form to your website. ARForms is a Premium WordPress Form Builder Plugins that comes with 25+ elements for building any kind of forms. The forms build by the plugin offers a clean material designed style as well as rounded and standard style forms. It is a fully responsive plugin that works well on all types of viewing devices. Also, the plugin is based on the real-time editor. Hence you can fetch the preview of the form you created before placing them on your website. Finding the best WordPress Form Builder Plugins is a tough task, keeping in mind that there are tons of WordPress plugins that will help you to build forms. The above list will sure cut down your search and you will be creating beautiful forms in very less amount of time. Hope the article helped you to choose a perfect Form Builder Plugins for your WordPress site. If you think that there is any plugin that should be mentioned on the list, please send your feedback on the comment box below. 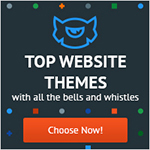 Also, if you are looking for other types of WordPress plugins then you can check out our ultimate collection of Best WordPress Plugins for 2018. Hey Buddy!, I found this information for you: "5+ Best WordPress Form Builder Plugins". Here is the website link: https://wpallclub.com/best-premium-wordpress-form-builder-plugins/. Thank you.